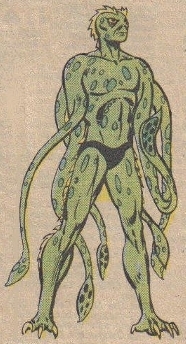 Powers/Abilities: A'askvarii have six tentacles, three originating from each shoulder, but are otherwise grossly humanoid in composition. Able to breathe underwater or on land, A'askvarii have facial gills in place of a nose, closely-spaced needle-sharp teeth (presumably indicating a carnivorous nature), and an elongated, forked tongue. They hatch from eggs (presumably indicating they are oviparous (hatching from eggs deposited externally some time before), as opposed to ovoviparous (hatching from eggs within the mother or almost immediately after extrusion from the parent). They require a special uniform to prevent rapid dehydration on land, as well as protection from temperature extremes. Derath, at least, possessed rudimentary telepathy, enabling him to assimilate the language of another sentient by direct contact. Traits: The A'askvarii live in a leaderless anarchy, but their peace-loving nature maintains this in a benevolent fashion. They are generally an unstructured people, independent but pacifistic (see comments), though they are certainly willing to kill (animals, at least) for survival. They are a modest race, content to live in the shadow of such imperial states as the Rigellians, Kree and Kirgar. A'askvarii have built intermediate-level interstellar starships with rudimentary warp-drive capacity. (Thor I#335 (fb) - BTS) - An unidentified apparent A'askvarii, presumably an inhabitant of the scholarly planet Rus, was pulled into the Runestaff when its new owner Kamo Tharnn conjured improperly. (Black Goliath#5 (fb) - BTS) - On one mission, Derath discovered and crashed on the desolate (desert and mountains) Kirgar, damaging his ship beyond repair. (Black Goliath#5) - The Earth hero Black Goliath (Bill Foster), along with Celia and Keith Jackson were banished to Kirgar by an energy blast from the Stilt-Man (Wilbur Day). Derath encountered these and led them to the former stronghold of Kirgar's last warlord and devised the means for them to use the energies from Stilt-Man's blast in reverse, which would send them to Earth. Derath sacrificed himself saving Black Goliath and Celia from the stronghold's android guardian, Mortag. Black Goliath destroyed Mortag, after which Black Goliath and the Jacksons headed home. Keith Jackson decided to finish Derath's log and keep it until he could return it to his people and/or his family. (Thor I#335 (fb) - BTS) - After retrieving the Runestaff following it having been taken by Hercules, Kamo Tharnn attempted to use the Runestaff again, and its inhabitants, presumably including the apparent A'askvarii, were transferred into Tharnn himself. (Thor I#335) - The Asgardian goddess Sif used the Runestaff on Kamo Tharnn, freeing all those who had been trapped within, including the apparent A'askvarii. (Quasar#58) - An unidentified pair of apparent A'askvarii attended the awards ceremony for the Galactic Marathon, which Makkari of Earth's Eternals won. In Galacta: Daughter of Galactus#1, Galacta consumed some A'askvarii. I would not think the character and stories in Galacta are part of Reality-616, but that has yet to be definitively confirmed anywhere. For the record, around that same time, she also feeds on some Badoon, H'ylthri, Aedians, Tribbites, Shi'ar, Pheragots, Tektons, Herms, Kosmosians, Laxidazians, Centaurians, Flb'dbi, Ul'lula'ns, and R'malk'i. In Black Goliath#5, Derath notes the A'askvarii to be a peace-loving people. I'm not sure that's quite the same as pacifistic, which I usually find to mean opposed to violence of any kind for any reason. Derath did what he had to do to survive on Kirgar, though that mostly involved combating the hostile climate and local fauna. He also referenced "Lord of the Dark Tower..." ...whatever that is. In Black Goliath#5, Sharra is first referenced, in the context of Sharra’s Forge, the cruelest terrain on the cruelest of planets, Kirgar. The forge was named, “in bitter irony,” for the mother goddess of legend. or perhaps they just learned of Sharra and Kythri and adopted their worship? maybe Claremont is planning some big reveal on the 50th anniversary of this story, which is about 14 years off at the point I review this profile on August 11, 2012. While neither the Runestaff inhabitant nor the Galactic Marathon attendees were identified specifically as A'askvarii, they are fairly convincing. The former looks to have been drawn directly from the OHotMU image, with similar posture and spots, etc. The color is off, but it was a really tiny character; the spots, the nasal pattern, the crests on the head, and the triangle eyes, which fit nicely with the shading around the OHotMU image's eyes, all convince me. The latter is pretty clear, b/t the tentacles, dual head crests, etc. A few points, courtesy of Donald Campbell in italics, with responses from me in some places in bold. The idea that the A'askvarii homeworld O'erlanii is located in the Deneb star system comes from the Official Handbook...further, O'erlanii and Zenn-La are both described as "third from sun." However, SILVER SURFER III#2 shows the Surfer going home to Zenn-La. As part of that journey, the omniscient narrative on page two reveals that his destination is a place where "shines a steely bright star - - Deneb! Around that star spin its thirty-seven planets, with their 93 moons! The fourth planet from Deneb is Zenn-La!" So, Zenn-La should actually be listed "fourth from the sun." Also, while the Deneb shown in that issue is yellow like our sun, Sol, the Deneb which exists in the real world is a blue-white super-giant which is so young that it has absolutely zero chance of being orbited by habitable planets with sentient native lifeforms. In Kamo Tharnn's first appearance it was implied that his world had been in ruins for quite some time, long enough for the beast-men to multiply and overrun the planet. I'm thinking in terms of centuries or millennia (although it could just be decades or years). Therefore, since the devastation was caused by Tharnn's improper use of the Runestaff, the (Thor I#335 (fb) - BTS) which recounts how the scholars of Rus were pulled into the Runestaff should surely be placed before the much more recent (Black Goliath#5 (fb) - BTS), right? --Agreed. Most likely scenario is what you proposed. I believe that you're over thinking the connection between Sharra's Forge on the planet Kirgar and the Shi'ar goddess Sharra. For one thing, since the Kirgar empire is said to have collapsed so long ago, it seems likely that its civilization was gone even before the Shi'ar went into space to build their empire. If so, then there would be (almost) no chance that the Shi'ar goddess Sharra and the mother goddess worshipped by the people of Kirgar were the same deity. Furthermore, the story doesn't reveal WHO gave "Sharra's Forge" its name. If the Kirgar empire collapsed so long ago, then how would modern-day space explorers know what the native name for that terrain was? It's possible that some Shi'ar scout explored Kirgar and s/he named that area after Sharra. On the other hand, even if "Sharra" is the name of the mother goddess worshipped by the Kirgar natives, so what? Space is so vast, with billions and billions of inhabited planets, that it's inevitable that at least two planets would have inhabitants who worshipped different gods who just happened to have the same name (or, as you said, "perhaps it was all just strange coincidence.") There's probably an alien race out there somewhere who worship a god named "Thor" who is not blond...or male...or even humanoid. Of course, the real reason for this similarity is that this Black Goliath story was written by Chris Claremont, the creator of the Shi'ar (and their gods). And long-time readers of his work know that Mr. Claremont does sometimes reuse elements from his earlier stories in later tales. --And that's the bottom line. Since Claremont wrote it, there PROBABLY is a connection. Connection seems to be the rule rather than the exception in comics. Your suggestions may well be the case and they definitely are comments-worthy for the profile, but we'll probably never know the "truth."